Prevention will depend on the individual predisposition of anatomical structures along with appropriate structures to strengthen or lengthen focused in the treatment section. It is imperative to minimize tracking and pain evident of the physical activity performed. 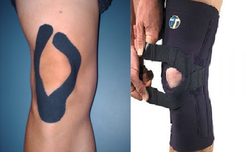 For maintenance and preventing further maltracking, taping methods and bracing can be utilized. Andrish J. The management of recurrent patellar dislocation. Orthop Clin North Am 2008; 39(3): 313-327. Arendt EA, Fithian DC, Cohen E. Current concepts in lateral patella dislocation. Clin Sports Med 2002; 21(3): 499-519. Draper CE, Besier TF, Fredercison M et al. Differences in patellofemoral kinematics between weight-bearing and non-weight-bearing conditions in patient with patellofemoral pain. J Orthop Res 2011; 29:312–317. Fithian DC, Paxton EW, Stone ML, et al. Epidemiology and natural history of acute patellar dislocation. Am J Sports Med 2004; 32(5): 1114-1121. Frosch S, Balcarek P, Walde TA et al. The treatment of patellar dislocation: a systematic review. Z Orthop Unfall 2011 Dec; 1249(6):630-45. Greiwe RM, Saifi C, Ahmad CS, Gardner TR. Anatomy and biomechanics of patellar instability. Oper Tech Sports Med 2010; 18(2): 62-67. Koeter S, Diks MJF, Anderson PG, et al. A modified tibial tubercle osteotomy for patellar maltracking: Results at two years. J Bone Joint Surg Br February 2007; 89-B:180-185. Sheehan FT, Derasari A, Fine KM, Brindle TJ, Alter KE. Understanding patellofemoral pain with maltracking in the presence of joint laxity: Complete 3D in vivo patellofemoral and tiobiofemoral kinematics. J Orthop Res 2009; 27:561–570.